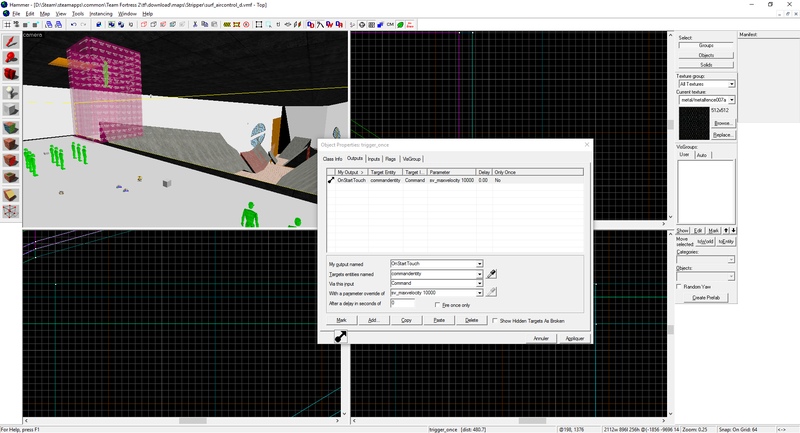 Should surf_aircontrol have a maxvelocity of 10000u/s like it is suppose to? At spawn, there is a command that tells the server to set its maxvelocity to 10000, except that the porter forgot to replace the css command "sv_maxvelocity 10000" to the tf2 command "sm_cvar sv_maxvelocity 10000". The map is supposed to be played at 10000u/s since the beginning. Should the map have its maxvelocity changed, which would allow the admins to probably remove the prophop at spawn, but also the crouch-boost+missing textures bonus, or should we just touch nothing and keep playing slower? Re: Should surf_aircontrol have a maxvelocity of 10000u/s like it is suppose to? Eh I don't really see a point this late into it. Maybe if it was a week after it got put on or something sure, but all the times are pretty set. I generally dislike messing with high played maps due to how shifted points can get. I personally want to leave it alone and keep it as is. The point is to have the map being palyed as it was intended to be played, and also to get rid of the prophop + cboost times. No times have to be removed or even added. I litteraly see no downside to this other than allowing people to get the full experience of the map. I made a poll in the first post to gather opinions on the question by the way. I ported this map, and no. Leave it alone. The reason why I say this is because the actual BONUS of the map uses the maxvel 10,000...which I had to remove because it relied on changing the player's movement speed with the movement trigger that doesn't work in tf2. The sv_maxvelocity is a global server setting that affect all the map, not just the bonus. This sounds pretty obvious to me. This means that players in css normally can go over 3500 u/s, even when outside the bonus. The speedmod entity only changes your local host_timescale, meaning that your speed in units per timescaled seconds in the exact same, so is the speed cap. If you really wanted to remove it, then you should have removed this trigger_once from the map as well as its outputs. If your goal was to port the map as close as possible to what the map tried to play like in css, then this issue should probably have been fixed by now. if you don't believe me, just watch this video. His time is 36.85 seconds. Our wr with prophop cheats is over 40 seconds. Clearly you can see that he is faster than 3500 u/s when on the second half of the map. Also cubemaps are missing but thats okay I guess? Its not like we have textures on the bonus anyway.